February 28, 2018 - Nordost is happy to announce the expansion of our acclaimed Blue Heaven Range with the introduction of the Blue Heaven Subwoofer Cable. The Blue Heaven Subwoofer Cable makes it possible for music lovers to completely integrate subwoofers with their loudspeakers, creating a truly well-rounded experience, highlighting even the lowest frequency extensions on the spectrum. The Blue Heaven Subwoofer Cable consists of four, 22 AWG, solid core, silver-plated, 99.9999% OFC signal conductors. Its dielectric strengh is improved by an innovative precision FEP extrusion process, which further increases signal speeds and accuracy in signal transfer. The conductors are then covered in a braided shield, addressing any EMI and RFI. Additionally, the Blue Heaven Subwoofer Cable utilizes a unique flat, parallel construction. In order to accommodate all its possible uses, the Blue Heaven Subwoofer Cable is offered in three configurations: Straight, Y, and Y-to-Y. All three configurations are available terminated with specially designed, gold-plated MoonGlo RCA or XLR connectors. 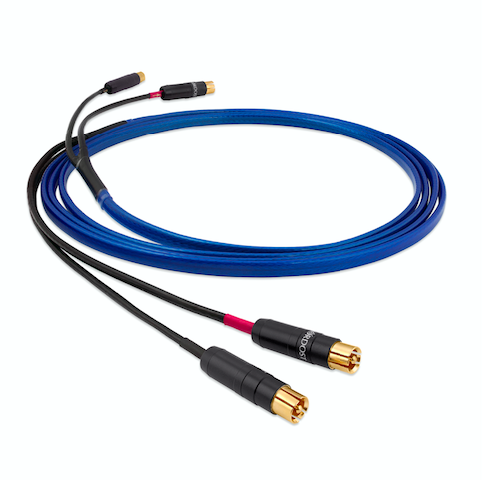 Designed, manufactured, and hand-terminated entirely in the USA, the Blue Heaven Subwoofer Cable guarantees the accurate construction required to produce integrated low level frequencies, while preserving the precision and speed necessary to enjoy well rounded, seamless, and all-encompassing sound from music, movies, and television. The retail price for the Blue Heaven Subwoofer Cable starts at $349.99 for a 2 meter length; additional meter increments are $75.00. The Blue Heaven Subwoofer Cable is now available for purchase at select Nordost dealers, worldwide. To find the Nordost dealer nearest you, visit the “Where to Buy” page on www.nordost.com.